Today, I had to drain some power out of one of my portable power packs, so I thought I'd have a little shoot with my buddy, Thor. This was Thor's first shoot with lights set up, but I have to say, he did an awesome job. For anyone who's met Thor, he's kind of known as this crazy black ball of energy covered in fur. 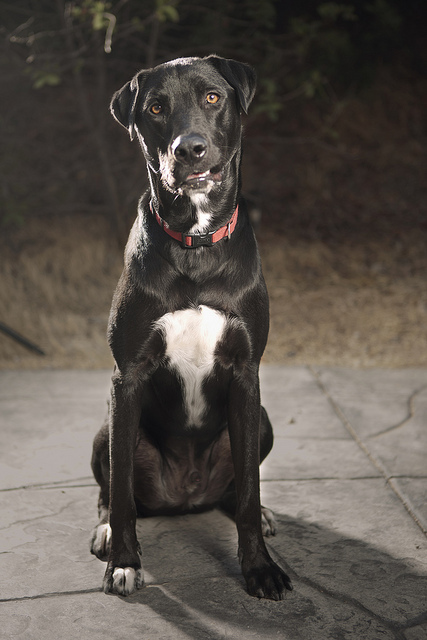 For the shoot though, he was very well-behaved. He sat where I wanted him to sit and stayed there, and he even knew how to move forward a few inches when I said "Just a little bit more - right there!" Have to say, he's quite a charmer on camera. ...except for the smile in the photo to the left. Click the photo to the left to see his whole shoot.